Japan's first commercial communications satellite services began in 1989 when a small consortium, Japan Communications Satellite Company (JCSAT), now Japan Satellite Systems, Inc. (JSAT), launched two satellites, JCSAT 1 on March 6, and JCSAT 2 on December 31. The satellites relay signals for voice, television, facsimile and high-speed data services for business use throughout Japan. The JCSAT spacecraft also transmit high-quality broadcast video and data directly to customer sites. The satellite contract, which JCSAT awarded in June 1985 to Hughes Space and Communications International, Inc., (HSCI), included two Hughes HS-393 spin-stabilized spacecraft and two control stations in Japan. JCSAT 1 and 2 were built at Hughes' Integrated Satellite Factory in El Segundo, Calif. Launch, mission and insurance arrangements were made with Hughes Communications, Inc., (HCI), which, like HSCI, was part of Hughes Electronics Corporation. The Hughes HS-393 is similar to the popular Hughes 376 model but has nearly twice the size, power and channel capacity. The satellite's high power and large antenna permits the use of ground antennas as small as 1.2 meters (4 feet) in diameter, significantly cutting the cost of data distribution for business customers. Operating at the Ku-band frequency, JCSAT 1 and 2 each provide thirty-two 27 MHz wide channels and use a 20 watt transponder. On orbit, with solar panels deployed and antenna raised, the satellites measure 10 meters (32 feet 11 inches) high and at beginning of life weigh 1364 kg (3006 pounds). Stowed compactly for launch, with solar panels telescoped together, antenna reflector folded down, and perigee motor tucked inside, each measures only 3.4 meters (11 feet 2 inches) in height and 3.7 meters (12 feet) in diameter. The large 2.4 meter (8-foot 2-inch) antenna and multihorn feed array produce a shaped beam on the contour of the four Japanese main islands and Okinawa, providing a signal strength of 50 dBW over the most densely populated areas. The antenna contains two offset polarized reflectors, one sensitive to vertical polarization, the other to horizontal. This design doubles frequency use. The K7 and K4-3/4 solar cells cover the surface of each satellite's two cylindrical solar arrays and generate 2350 Watts at the beginning of life. Two 38 ampere-hour nickel-hydrogen batteries provide power when a satellite is in the earth's shadow. JCSAT 1 was launched on Ariane-44LP H10 booster, JCSAT 2 was launched on a Commercial-Titan-3 [Orbus-7S] booster. Both were placed directly into a synchronous transfer orbit. The spacecraft's onboard liquid bipropellant system was then fired to circularize the orbit at the 36,000 km high synchronous orbit. For this function, the propulsion system used two 110 pound-force Marquardt R-4D thrusters. The system uses six 5 pound-force thrusters to provide impulse for stationkeeping. The satellites are located at 150 degrees and 154 degrees East longitude respectively. 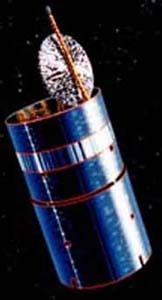 JCSAT 1 is due to be retired in 1997. JCSAT 2 is expected to operate until early 2000.